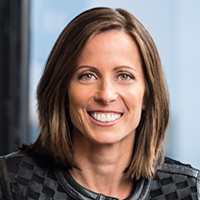 Adena Friedman assumed the role of President and Chief Executive Officer of Nasdaq on January 1, 2017 and is a member of the Board of Directors. Ms. Friedman brings more than 20 years of industry leadership and expertise and is credited with significant contributions that shaped Nasdaq’s strategic transformation to a leading global exchange and technology solutions company with operations on six continents. Prior to her appointment as Chief Executive Officer, Ms. Friedman served as President and Chief Operating Officer of Nasdaq throughout 2016 and was responsible for overseeing all of the company’s business segments with a focus on driving efficiency, product development, growth and expansion. Ms. Friedman rejoined Nasdaq in 2014 as President to oversee the technology, information, and corporate businesses that comprised over two-thirds of Nasdaq’s revenues. Prior to her return, she served as Chief Financial Officer and Managing Director of The Carlyle Group from March 2011 to June 2014, and played a significant role in taking the company public in May 2012. Before Carlyle, Ms. Friedman was a key member of Nasdaq’s management team for over a decade, serving in a variety of roles including head of the company’s data products business, head of corporate strategy, as well its Chief Financial Officer. She played an instrumental role in the company’s acquisition strategy, overseeing the acquisitions of INET, OMX, and the Philadelphia and Boston Exchanges. She originally joined Nasdaq in 1993. Ms. Friedman was elected in December 2018 as a Class B director to the Federal Reserve Bank of New York. Ms. Friedman earned an M.B.A. from Owen Graduate School of Management, Vanderbilt University, in Nashville, Tennessee. She holds a B.A. in political science from Williams College in Massachusetts.